And is it not common sense to now create new biodegradable ‘plastics’ such as from corn starch, or otherwise glass, and ban outright production of non biodegradable plastics? why continue a bad path when it is known to be extremely bad? Thanks for the comment, and I agree that these plastics can very well cause health issues longterm because of their chemical composition. However, the chemicals used during processing of the fibers into fabric (the softeners, the dyes, etc.) can pose just as great a threat as the chemicals used in creating the fiber. So if you could find a polyester fabric that is processed to the GOTS standards it would be much better for you than the standard, conventionally processed recycled polyesters. Assuming, of course, that you’re willing to use a synthetic. But I have to say that when I shop for clothing now it’s very hard to find even 100% natural fibers. I agree that research should be done into biodegradeable plastics (and it is!) but the issues are tremendous – for example, each plastic has certain specifications. I did read about one new company is producing mushroom based packaging material to replace those styrofoam peanuts (see http://www.greenbiz.com/news/2010/08/10/mushroom-based-packaging-98-percent-less-energy-styrofoam). It looks very promising. Little steps! 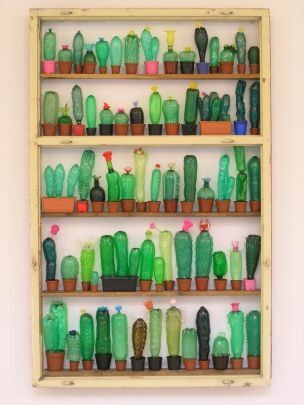 I suggest that the most ecologically friendly option is to use the PET bottles to build vertical gardens (as I have figured out how to do), in the city where their contents are consumed. These could be planted with food plants, thus contributing to the sustainability and security of food production, while reducing transport costs and impacts … and making the city a better place to live.